Sessions: April 12 and May 3. -- Learn the QB Mindset. Win the Mental Game. 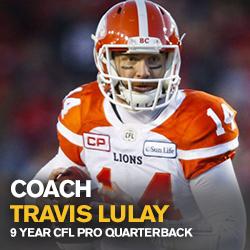 Every session includes QB-specific life lessons from Coach Travis. Apply life skills for peak performance both on the field and in all aspects of life. -- Combination Classroom and On-Field QB Instruction. Classroom Sessions for improved Football Acumen and Powerful QB-Specific Teaching. 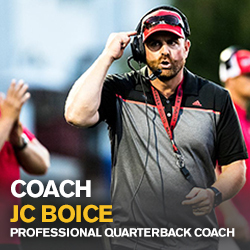 Participants will also receive members access to the All New QBA Performance Center featuring online support material for ongoing QB Development and Recruiting Tips. -- Limited Enrollment to Ensure Personal Interaction and Maximum Reps.
Quarterbacks work in a small group setting for detailed, personal instruction on every rep from Coach Travis, Coach Rob, Coach JC and our College Mentor Staff. -- Throw with more Power and Consistent Accuracy. -- Advanced QB Movement Training. 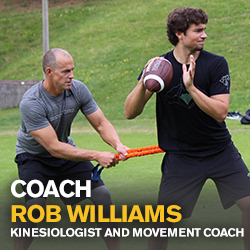 Learn cutting-edge movement strategies to generate explosive mobility both within and outside of the pocket. Learn how to extend plays with improved athletic burst and balance! --SPECIAL NOTE for Quarterbacks! This training will feature both development instruction (explicit learning) with high-frequency repetition (implicit learning) so please make every effort to bring at least one registered Receiver to partner with. Adding Receivers to our sessions is a powerful dynamic that further accelerates your learning curve. ​Your receiver will also get quality, individual instruction throughout training. QB's without a Receiver in attendance may have their reps reduced in certain training segments. --Complete Receiver Training. Detailed instruction for all aspects of Receiver Play. Stance, Release, Route Running, Ball Skills, Blocking, Defensive Coverage Recognition and Instruction on cutting-edge movement strategies for optimized athletic burst and balance. Tons of reps with Quarterbacks. 12+ Quarterbacks are placed into age and skill level appropriate small groups. Youth QBs (9,10 and 11) will be allowed if they can demonstrate competitive work ethic and focus. SPECIAL NOTE: We have ADDED Receivers to the remainder of our Vancovuer Sessions. QBs, please make every effort to bring at least one (1) registered Receiver to our training sessions. Having Receivers adds such a great dynamic to the overall training and while QBs will be working on QB specific skill development the Receiver Group will also have dedicated movement and receiver specific instruction.